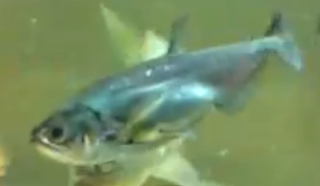 Sabre Tooth Tetra is a freshwater tropical species and the appearance of the fish is practically plain and colorless. It was originally classified as part of the Characidae family but unlike normal tetra fish that belongs to the group which are generally peaceful, sabre tooth tetra is totally different as the fish are known to be a very aggressive species. It has since been assigned to its own family Cynodontidae. Sabre Tooth Tetra is sometimes referred to as Payara Fish and some has even named it as Vampire Tetra for the presence of two large fangs and also due to its predatory instinct that will seek out and hunt its prey. In fact, the fish actually belongs to the Amazon river close to where the piranha lives and exists. Over the past few years, popularity on Sabre Tooth Tetra as pets has grown and aquarists have even tried to rare the fish in home aquarium and so far, most of these attempts have not been successful with some reporting that it only managed to survive for few months. In fact, even with large tanks, aquarist tried to provide the best they can to simulate just like in the natural environment by providing strong water current using powerhead filters but only a handful managed to grow until it reach maturity age. Don't get yourself confused if you see the normal 4 to 5 inches fish sold in pet stores because basically those are still young juvenile as an adult sabre tooth tetra can actually reach maximum length of 26 inches. There are also different variants of the fish and the most popular is the red tailed payara. In terms of community behavior, Sabre Tooth Tetra can be mixed with other tankmates as long as the other fish are bigger than its size. Angelfish, red-tailed black shark and pacu are some of the common tropical freshwater species which could live together with it. When it comes to water requirements, the condition needed should be about the same as any other tropical fish adaptability with soft water, pH ranging from 6.5 to 7.5 and temperature within 24 to 28 degree Celsius. The best diet for your payara should consist mainly of live feeder fish because that is the food they will enjoy the most. Usually people will use guppy, small goldfish and put it into the same tank and let the fish devour its prey. With its large powerful jaw, the feeder fish will be swallowed alive and then crewed inside the sabre tooth mouth, which is full of tiny teeth. This is definitely not the type of fish recommended for aquarium beginners except for those who are into exotic freshwater species.